Whether you're racing toward a 5K finish line or you're training to cross that marathon off your bucket list, we've compiled a list of our favorite items that will help any runner achieve their goals! As you start racking up the miles, you might notice some painful chaffing spots appear due to prolonged rubbing of your skin by clothing, footwear, or other areas of skin. Use an anti chafe balm pre-run to help protect your skin. Keep those post-sweat showers wince free and get yourself a stick of Body Glide! Need a place to stash your keys, phone, headphones, etc... while you're out for a run? Give the Flip Belt a try! Waist storage belts like these are ideal for comfort, equal weight distribution , and maintaining good running form as opposed to something like an arm band carried by just one side of your body. To relax and recover after a long run or hard cross training sesh, try a soak in the tub with Epsom salt. This can help reduce inflammation, soothe muscle pain, and provide relief for aching feet. Not only do these socks come in a variety of fun colors and designs but the compression allows you to perform at your peak by increasing blood flow and providing support for tendons and muscles. Tip* - follow them on Facebook to find coupon codes for special savings! These ankle socks provide great compression and contoured support for runners! These will quickly become your favorite socks for all of the Fit4Mom classes you're rocking. Proper footwear is key for each run and every runner is different. Seek professional guidance like that offered by our favorite source of running gear, Fleet Feet Louisville, when selecting your running shoes. Foam rolling is great for recovering and feeling your best after a run. It helps work out kinks, knots, and tight muscles through self massage. Every runner needs a foam roller! They're inexpensive, polarized, anti-slip, and they come in every color imaginable. This one is a no-brainer. Go on and buy two pair because your spouse is going to steal one of them. Monitor your performance stats, track your progress over time, & connect with your running buddies on this free app. 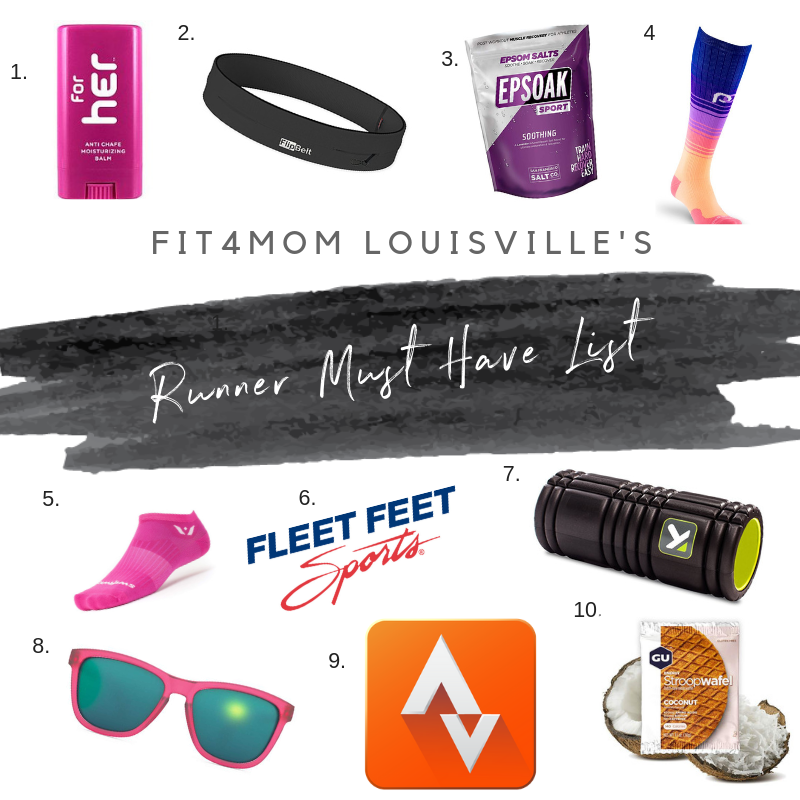 Whether its gels, chews, bars, or capsules that keep you going on those lengthy runs, Fleet Feet Louisville has something perfect for helping you power through to the end. Stop in their store in St. Matthews to check out their entire stock of Energy Drinks & Food.